This blog spends a lot of time covering Energous, the RF based at-distance wireless power company, as in my opinion it's such a good example of how to manipulate the press, public, and markets with not much more than great PR and a willingness to be 'flexible with the truth'. In their own little world there's some competition from other companies essentially doing the same thing, in a technical sense. The most prominent of these are Ossia and Powercast. I've been asked a few times about these companies and why I don't really cover them, and the basic reasons are these - they've not been blatantly lying about technical capabilities (to date, read on for some concerns), deliberately creating multiple product lines to confuse media and consumers, or funneling money from the general public straight into the pockets of the executives. There have been enough questions though that I wanted to clarify who these companies are, what they offer, and the (minor) technical differences between them and Energous. Powercast have been in operation since 2003, and have had an at-distance RF based wireless power system available and FCC approved since 2010. Like Energous they operate in the ~913MHz band, and the physics involved is essentially identical. They have a number of patents in the area. You can actually buy development kits to test them out, their website has detailed technical datasheets on all products, a simple but realistic spreadsheet for calculating actual power that can be delivered. The datasheets make it clear that they should be useful for wireless sensors and low power electronics, and never mention phones, tablets, TVs, cars, or any of the other ridiculous items other wireless power companies talk about. They don't spout techno-babble about "energy pockets" that they can't deliver on (like Energous' demonstrated inability to accurately focus in their FCC Part 18 filing). The two product lines for receivers state up to 100 mW for the short range (over 2 days to charge a phone), and 10 mW for the long range (nearly 3 weeks for a phone), and that's maximum. More realistic is 1/10th of that, and that's reflected in the Powercast descriptions of 'microWatt to low milliWatt' levels. 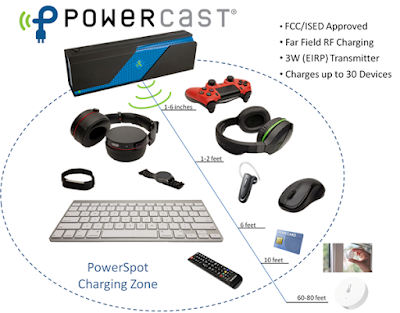 Powercast products are FCC Part 15 approved, which is the same rules under which your WiFi router operates - yes, it's that kind of power level we're talking about here. Could they get FCC Part 18 'unlimited power' certification? Yes, I think they could, and they might up their power output by a factor of 2 before all sorts of other safety limitations kick in. In practical terms Part 18 would buy them limited benefits with a number of restrictions, though clearly from the Energous buzz around their Part 18 approval it's worth a lot marketing wise. So what does Energous have that Powercast doesn't? In my opinion basically nothing, except a marketing department willing to push the boundaries of truth, and an FCC Chairman willing to use his public position to promote a private company. Powercast appear to me to be a genuine engineering company, following all the rules and regulations, that has a product that you can buy, and are completely upfront and clear as to the technical capabilities and limitations. They may not have a desperately useful consumer-level product, but that's not to say it does not have its application. With regards to phones, if someone like Apple had wanted to, they could easily have made an offer that Powercast couldn't turn down and incorporate this tech into their equipment. But they didn't, and is a firm and clear datapoint that RF wireless charging isn't really viable in the consumer space. Powercast's website lists a number of design wins that may well have specific demands that make the technology appropriate for that case. I can see it being used in industrial settings, charging large numbers of extremely low power sensors in awkward to reach locations. They mention RFID on their site, and it seems like a good fit for those conditions. Use of this technology may also grow as the number of "Internet of Things" devices increase. In my opinion, Powercast should be commended for sticking to an honest approach to their business in the face of what must be incredibly frustrating marketing and publicity from Energous. Like many engineering led companies that focus on delivering a product and not on marketing hype, their approach probably gives them a good business but fails to deliver them the riches that the less scrupulous get. The price of a conscience? Ossia have been going since about 2008 and are still privately held, having raised at least $25 million from industry and Venture Capital groups including Intel. Their technology, which they brand 'Cota', is also RF based, but this time at 2.4 GHz, same as some WiFi routers. Their founder/CTO writes blog posts and technical white papers available from their website, but they are exceptionally light and free from any real information with which to analyze their products in detail. There are no products, datasheets, or evaluation kits of Ossia technology that I am aware of. Their choice of 2.4 GHz results in a smaller wavelength than the 900 MHz band (around 12.5 cm vs 33 cm), so in theory can lead to greater control over small focal zones and beamforming. At best the focus will be at least a phone sized sphere in any practical situation, but it's better than the beachball sized 'pocket' Energous have. By creating a large phased array of many small transmitters, and sending the right signal to each, a beam could be steered with reasonable precision - their 'ceiling tile' size array (pictured above, from here) could have 10 by 10 emitters each spaced at half a wavelength, and according to this article is closer to 16 by 16, so 1/3 wavelength spacing. Larger arrays mean greater control, I covered some of the maths behind this here. Ossia claim this allows them to be much more precise in targeting the receiver, and 'bounce' signals around the room so that direct line of sight isn't needed. The image below from Ossia shows this in operation, with the receiver sending out a location signal about 100 times a second. This is a pretty well known engineering technique, sometimes called time-reversal, so under the right conditions it will work. It does not, however, reduce the size of the smallest possible focal zone, remove safety limits, or increase the amount of power legally transmittable. Under Part 15 rules, Ossia can still only transmit as much power as Powercast, which means the entire system is just a more precise way of delivering microWatts to low milliWatts and leaves phone charging as an impossibility. Much of Ossia marketing material in the last few years has made it clear they're looking at similar low power situations as Powercast. Their statements are sometimes questionable, for example that 2.4 GHz is 'safer' than 5.8 GHz, can allow more precise targetting, and won't interfere with WiFi. I wonder if they'd say the same now that Energous have moved from 5.8 GHz to 913 MHz? What about Part 18 and 'unlimited power'? 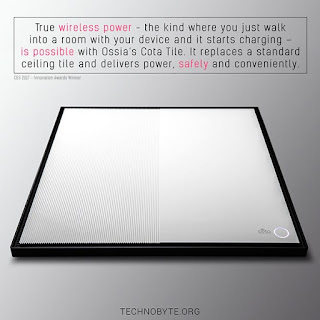 There's no reason that Ossia can't do this, and once again will be limited not by transmit power, but the various safety restrictions, which like Powercast means perhaps a factor of two increase in power delivered. Why haven't Ossia done this, as it's not a complex set of tests to go through? While the FCC have not made specific statements on this, it seems they are unwilling to give Part 18 certification on wireless power devices in the 2.4 and 5.8 GHz ranges. Energous started at 5.8 GHz, but rapidly moved to 913 MHz when they repeatedly failed to get FCC approval in 2017, skipping 2.4 GHz entirely (there are limited frequency bands that are available in Part 18). While Ossia have been playing by the rules and not putting out highly misleading marketing, I've been disturbed by some of their recent press. This article looked at both Ossia and Energous, and reached the usual level of in-depth analysis by a tech journalist that I'm used to (i.e. none). At first, Ossia demonstrate a transmitter with 10 Watts of output power - that's clearly well beyond Part 15 limits, and matches the 10 Watts of the Energous Part 18 transmitter. "The maximum range is somewhere around 30 feet, but at that distance you can only receive a very small amount of power. Within 6 feet of the transmitter, you’ll get somewhere around 1 watt from the 10 watts being transmitted. At longer distances, you might expect 100 or perhaps 200 milliwatts, which isn’t enough to charge up a smartphone, though it can slow down the discharge." Since they don't have Part 18 approval, that device needed to have a clear notice that it was not FCC approved and is not available for sale. I wonder if they had it and the journalist simply failed to notice? I also find their numbers disturbingly high - remember Energous transmits 10 Watts to get 30 mW at 90 centimeters, are Ossia really getting 33 times the power at twice the distance? That implies some massive directionality and antenna gain, and regions of space between transmitter and receiver going well over safety limits like SAR and MPE. There are at least two other RF based wireless power companies out there besides Energous. One of them has had an approved device on the market for years, but has minimal traction in the consumer market. The other seems to be trying a more technically sophisticated version of the same thing, but are now watching Energous getting away with very misleading marketing. Both are limited by the laws of physics, and safety rules, that mean powering phones or any other sizeable devices is out of reach. Despite that, tech journalists will continue to publish puff pieces on how wireless power for phone charging is just around the corner. I can't blame companies who follow the law from trying to get favourable coverage. The tech press, however, need to wake up to the fact that they are now reporting on products and markets that directly affect our health and safety. Despite high profile cases like Theranos, it seems to be business as usual. The usual cursory coverage and regurgitation of company PR doesn't cut it in these situations, this isn't the latest iPhone or a dating app, and they need to step it up before something hurts more than investors wallets. Hi, as an engineer, I like your blog a lot. It happens that I am trying out some Powercast product for charging home automation appliance. Bad choice really, given the power consumption. I was looking at Energous and taking a second thought after reading your blog. However, do you have any recommendation for technology that can charge 3 feet away for about 1.5WH of power within 12 hours? Regards. I missed your question when you posted it, sorry for the slow response. You're asking for 130mW charging which is low for Qi or a wire, but add in the 3 feet limitation and I don't know of anything I'd recommend. Pi Charging claim to be able to do something like that with their "at a distance Qi" system but it is not released AFAIK, and Wi-Charge seem to indicate they can do it with a laser but I can't speak to effectiveness or safety there. For a well proven method, my answer is "use a wire". bouncing time reversal beamforming "does not, however, reduce the size of the smallest possible focal zone"
By using walls & ceilings as a large reflector, you could theoretically achieve smaller focus spots than with the transmitter array alone. No guarantee there'll be more power in this smaller focus spot, so efficiency may not improve at all, but the statement as you made it as a bit incomplete. So, yes and no. Spot size is roughly related to the size of your transmitter, the wavelength, the distance from transmitter to focus, phase control of each element, size of your element, directivity of each element (off the top of my head). By bouncing around off walls you may be able to increase the effective area of the transmitter used that would otherwise be obscured, but you're also increasing the distance travelled. Overall, I would guess it would come out in the wash in terms of focal size, total power might be slightly higher but not much. I just don't see it as a huge benefit or a game changer in focal zone size. I'd also take this opportunity to remind people that the focal zone for Ossia RF system is likely around 5 to 10 cm across - it's at least baseball sized I think. Energous more like a beach ball.